The EQC, powered by an 80-kilowatt-hour battery, delivers 450 kilometres (280 miles) of driving range on a full charge. Mercedes-Benz has fired the opening shots in what will surely be a bloody battle to dominate the next generation of powertrain technology. The German luxury brand on Tuesday unveiled its first all-electric vehicle, the EQC, in Stockholm. The compact crossover is expected to go on sale in the U.S. in 2020 and will be the first of a fleet of 10 full-electric EQ-branded vehicles. Powered by an 80-kilowatt-hour battery, the EQC delivers 450 kilometres (280 miles) of driving range on a full charge. Two electric motors generate a combined 402 hp, enabling a 0-to-60 mph sprint in a zippy 4.9 seconds. To reduce power consumption, the front electric motor is optimized for efficiency in the low to medium load range, while the rear e-motor adds sportiness. "With the EQC … we are flipping the switch," Mercedes-Benz Cars boss Dieter Zetsche said in a statement. "Electric drive is a major component in the mobility of the future. We are therefore investing more than 10 billion euros in the expansion of our EQ model portfolio and more than 1 billion euros in global battery production." Mercedes can't flip that electrification switch fast enough. Tesla Inc. dominates the luxury EV market with a trio of high-performance, buzzworthy models. A wave of competition, however, threatens to swamp the automotive upstart. "Tesla has virtually zero competition -- but this will change from 2019 onwards." Wajih Hossenally, automotive powertrain analyst with IHS Markit, told Reuters. In addition to Mercedes, German automakers BMW, Porsche and Audi are embracing EVs as they look for ways to meet tightening emission standards globally. Diesel engines, dogged by the baggage of emissions violations and facing bans in many major cities, are no longer an option. The Germans' combined market share of the electric-car market will surpass Tesla's to reach 11.8 per cent in 2020 before increasing further to about 19 per cent three years later, Reuters noted, citing projections by forecaster LMC Automotive. BMW next week will launch its Vision iNEXT semi-autonomous electric crossover. The iNEXT will launch with Level 3 autonomous driving technology -- meaning drivers must supervise the system and be ready to take back control -- and eventually incorporate Level 4 technology that will allow the vehicle to drive without human intervention in certain conditions. Production is expected to begin in 2021. Audi's e-tron will arrive in showrooms early next year, followed in 2020 by two more electric Audis. Mercedes parent Daimler has said it expects between 15 and 25 per cent of its global sales to be EVs in 2025. The EQ entries -- 10 of them by 2022 -- will have body styling distinct from existing Mercedes light vehicles in their segments. The EVs are part of 50 electrified vehicles planned by 2022. An electric version of Mercedes' A-class sedan could go on sale in the U.S. in the second half of 2020. An electric version of the GLB will launch in late 2020 and an electric version of the S class could roll out in 2020. The EQC, with a sporty and stretched silhouette, has design cues that hint at its electric drivetrain. In place of a conventional grille, the EQC has a large black-panel surface. An LED light strip connects the headlights. A similar design element is echoed in the rear. Other design features at the front include the air inlet with two chrome louvers in the lower area of the front apron and the simulated side air inlets in high-gloss black. The EQC is a nod to the modern vehicle's shift from transportation appliance to computer on wheels. Central to the in-cabin experience is Mercedes' new multimedia system. The Mercedes Benz User Experience, or MBUX, includes improved displays and speech-recognition capabilities, along with artificial intelligence and predictive learning abilities. The interior of the EQC takes design cues from consumer electronics. The louvered trim in the upper dashboard and door panels, for instance, resembles the cooling fins of a hi-fi amplifier. Production of the EQC will start in 2019 at the Mercedes-Benz plant in Bremen, Germany. 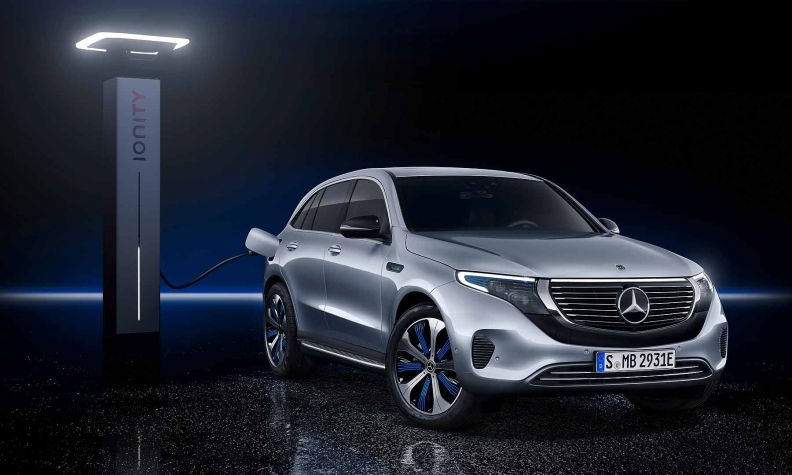 "Our decision to produce electric vehicles on the same line as models with combustion engines enables us to respond flexibly to demand and use plant capacity to best effect," Markus Schäfer, Mercedes-Benz Cars production and supply chain chief, said in the statement. "In this way we can continue to ensure both high efficiency and top quality with well-proven production processes." Performance: 402 hp, 564 lb.-ft.